The origins of a dock and slipway at this site can be traced back to the 14th century. The present retaining structure was built c.1868 as a parish dock when the Albert Embankment was constructed by the Metropolitan Board of Works to improve flood defences. Several other inland docks were built to enable continued access to the river for firms such as the Doulton Pottery. 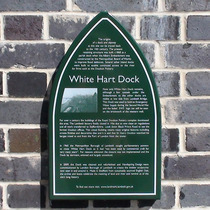 Now only White Hart Dock remains, although a few tunnels under the Embankment to the other docks are visible at low tide from Lambeth Bridge. This Dock was used to hold an Emergency Water Supply during the Second World War and the faded EWS logo can still be seen on the brickwork of the western wall. For over a century the buildings of the Royal Doulton Pottery complex dominated the area. The Lambeth factory finally closed in 1956 due to new clean air regulations and all work transferred to Staffordshire. Look down Black Prince Road to see the former Doulton offices. This Listed Building retains many original features including ornate finishes and decorative tiles and it is said that Sir Henry Doulton watched his barges travel to and from the Port of London from the tower. In 1960 the Metropolitan Borough of Lambeth sought parliamentary powers to close White Hart Dock as it had "not been used by commercial craft for very many years". For reasons unknown the closure was not implemented and the Dock lay dormant, unloved and largely unnoticed. In 2009, the Dock was cleaned and refurbished and Handspring Design were commissioned by London Borough of Lambeth to create the timber sculpture now seen in and around it. Made in Sheffield from sustainably sourced English Oak, the arches and boats celebrate the meeting of land and river and remind us of the site's long history. Clearly inspired by the shape of water-going vessels - even the plaque is ship-shaped. The two plaques are on different faces of the gate pier on the river side (right of photo).